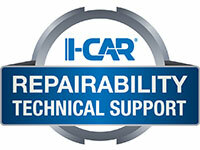 In order to develop a best practice around disassembly of a steel service part at a factory seam, I-CAR gathered a number of subject matter experts (SME) from vehicle makers, collision repairers, and insurance personnel. Now that the industry has completed the final review of the best practice, let’s take a look. Service parts must be 600 MPa or less. Steels over 600 MPa should not be disassembled, unless a vehicle maker procedure exists. Follow vehicle maker corrosion protection guidelines. Do not change the order of the panel layering (shingling) from the original part. Do not create a new joint. This best practice does NOT allow for sectioning of the part. 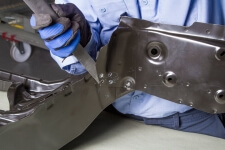 This means that if the part that is being replaced requires a new joint to be cut into it, this part no longer meets the requirements for this best practice. *If no OEM published attachment methods are available, use squeeze-type resistance spot weld (where two-sided access is available), followed by GMA (MIG) plug welds. Only use MIG brazing and rivet bonding attachment methods where specified in an OEM procedure.